Home NEWS Wainaina, Mukanjo picked to spearhead Uhuruto campaigns in Thika, Kiambu ahead of fresh election. Wainaina, Mukanjo picked to spearhead Uhuruto campaigns in Thika, Kiambu ahead of fresh election. President Uhuru Kenyatta addressing over 5,000 delegates drawn from 10 Mt. Kenya Counties who had gathered at the presidential retreat of Sagana Lounge on Friday to plan for his re-election. Jubilee Party has endorsed Thika Town MP Eng. Patrick Wainaina Wa Jungle and Former Hospital Ward Councilor Simon Maina (Mukanjo) to spearhead President Uhuru Kenyatta’s campaigns in Thika ahead of the fresh presidential election on October 17. The Thika team joins other leaders from Kiambu County under the stewardship of Governor Ferdinand Waititu and his predecessor William Kabogo. 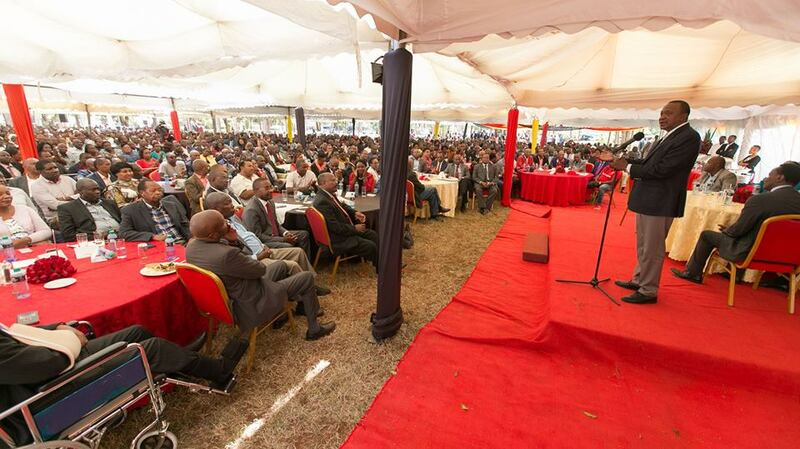 More than 5,000 leaders from the counties of Kiambu, Murang’a, Nyeri, Kirinyaga, Embu, Meru, Tharaka-Nithi, Laikipia, Nyandarua and Nakuru met President Uhuru Kenyatta at State Lounge Sagana on the foot of Mount Kenya in Nyeri County on Friday to strategise on how the campaigns will be conducted. While addressing the delegates, the President asked all those selected to ensure that he got all the potential votes in their counties. The teams were mandated to identify all those who never cast their votes on August 8 and make sure that this time round, everyone not only voted but voted for President Uhuru Kenyatta. President Uhuru was categorical that the repeat elections will be held on schedule and those attempting to delay the poll should know that they were putting the country at risk. “It is the will of the people that shall prevail. That is our declaration from Sagana. We are the majority, but do not mistake the silence of the majority for weakness. The independent body (IEBC) should deliver an election. We will accept the verdict of the people,” said the President. Speaking to the press after the function, Eng. Wainaina said that even though he and Mukanjo had been selected to head the Thika team, his team would include every stakeholder on board to ensure that every vote counted for the president especially in Thika Town Constituency. Wainaina noted that about 20% of the registered voters in the constituency, equivalent to about 30,000 people, did not cast their ballot on the 8th of August and there was need to identify exactly where they were and how they would be enhanced to get out and vote on October 17. “Our target is a 100% voter turnout on the 17th (of October). We shall go out of our way to identify the 20% (of the registered voters) who failed to cast their ballot in August and ensure that they will vote during the rerun and vote Uhuru Kenyatta,” said the Thika MP. He added that he would mobilise every local leader to persuade the ‘diaspora’ voters to this time round cast their vote for the President Uhuru Kenyatta. ‘Diaspora’ is casual dialect to refer to voters who originally hail from other counties but now live in Thika Sub-County. “I am telling everyone that the final five years of an Uhuru presidency will be his term to leave a mark and a legacy for the country. Let’s all give him the chance to drive Kenya to the next frontier as this will benefit not only this region but the whole country in general,” said Wainaina.